Citizens Parliament | "How can Australia's political system be strengthened to serve us better?" 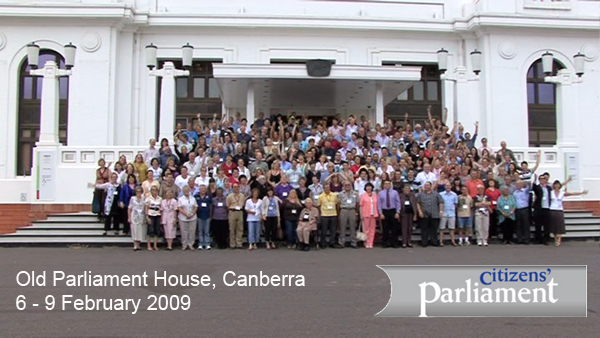 Australia’s first Citizens’ Parliament was held at Old Parliament House in Canberra from February 6th to 9th, 2009. One hundred and fifty people from across Australia spent four days discussing and debating our democracy and how it could be improved. The Citizens’ Parliament was an extraordinary forum. Australians not normally involved in the political process were able to contribute to discussion about how our governments work. The strengths and weaknesses of our democratic system were reviewed. Then through personal experiences, varied opinion and the sharing of information, a number of options for change were put forward. The conversations during the Citizens’ Parliament have been about complex subjects. Our congratulations go to the citizens of Australia who have so enthusiastically considered the enhancement of their democracy and those who have encouraged and recorded that enthusiasm through their own expertise, and excellent facilitation, organisation and research skills. This enthusiastic engagement is enormously important – it is the engagement of the Australian people which is at the heart of maintaining and improving our Australian democracy. We commend this report of their deliberations to you in the belief that it has an important contribution to make to the strengthening of Australia’s democratic system. 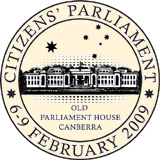 Australia’s first Citizens’ Parliament was held at Old Parliament House in Canberra from February 6th to 9th, 2009. One hundred and fifty people from across Australia spent four days discussing and deliberating about Australian democracy and how it could be improved. Everyone involved learnt a great deal about our system of government, how politics works and when and where citizens can have their say. They tried to imagine what a more citizen- friendly, accessible government might look like in the 21st century. Factors including the professionalization of politics and the decline of party membership have left many citizens excluded from the political system. The Citizens’ Parliament explored new ways to politically engage citizens in a modern democracy. Travelling to Canberra from each of the 150 federal electorates those chosen for the Citizens’ Parliament came from an initial random invitation list of 8,000 using the electoral roll. Of these people some 3,000 showed an interest in being involved and from that group the final 150 were selected. The cross-section of gender, age and cultural background amongst participants was a reflection of the diversity of our population. Those who were not selected to attend the Citizens’ Parliament could still become involved, via a series of regional meetings and an on-line forum, where participants were invited to submit proposals for debate in the Citizens’ Parliament. Their views and opinions have been tracked throughout the process as part of a research project to analyse how people’s attitudes and opinions change during a deliberative process. The Citizens’ Parliament was co-chaired by Lowitja O’Donoghue and Fred Chaney. Their role was to ensure the integrity of the process. In the opening ceremony, they recognized the long process that had involved many hundreds of people in getting to the first Citizens’ Parliament. Australia’s first Citizens’ Parliament was opened at 2.30pm on Friday February 6 in the Chamber of the House of Representatives by Cabinet Secretary and Special Minister of State, Senator John Faulkner. Senator Faulkner talked about the Federal Government’s commitment to community consultation and the core principles of openness, debate and deliberation. He noted that that policy should not be limited to the usual voices from whom we hear all the time. Senator Faulkner indicated that the government would look closely at the outcomes of the Citizens’ Parliament. Luca Belgiorno-Nettis, chair of the newDemocracy Foundation (one of the co-founders of the Citizens’ Parliament) also spoke at the opening ceremony, and hoped that people would continue their interest and ideas in improving the way we are governed long after the close of this first Citizens’ Parliament. After the opening ceremony, the participants began the work of deliberating about how to strengthen our democratic system. They did this with the support of 120 volunteers (small group facilitators, theme team, logistical support, writers and researchers—their details are available on the Citizens’ Parliament website). The 11 proposals developed from the online Parliament were tabled (see Appendix 1) and discussed and a new expanded list of proposals developed (see Appendix 2). Discussion was based around two key issues: what is it about our democracy that makes us proud; how can we make our democracy more like this? The participants met the panelists who were available as a resource for the Citizens’ Parliamentarians as they moved into the more intense deliberations of Day Two. Many of the panelists have spent their professional lives thinking about the way we govern – or working in the system – so were able to provide first-hand experience that the Citizen Parliamentarians could draw on. A number of different methods for encouraging discussion were used to get people thinking and sharing their ideas. These included: a World Café, where people moved from table to table to brainstorm what is important to them; a 21st Century Dialogue which networked 23 computers with direct on screen reporting of deliberation outcomes; and two panel discussions with subsequent question and answer sessions which helped participants in the process of starting to grapple with the practicalities of their ideas. On Day Three the participants analysed and synthesized their ideas into a final combined list of 13 through a group prioritization process. These ideas were collated into themes which included freedom, transparency, innovation and easiest to implement. The conversations during the Citizens’ Parliament were very complex. Many participants commented that they had learned a great deal about our political system and had heard new ideas and fresh perspectives. Given the opportunity and the right circumstances, the Citizens’ Parliament has been a valuable forum for exchanging and documenting ways in which we can become more involved in government decision-making. The Citizens’ Parliament was also a research project funded by the Australian Research Council—Linkage Grant with the aim of exploring new deliberative techniques for involving citizens in the political process. Day One of the Citizens’ Parliament began by expanding citizens’ understanding of the eleven proposals that were developed online prior to meeting (see Appendix 1). Then began an intensive program over four days during which innovative deliberative methods were used. These included an online process involving linked computer on 23 tables. Participants mostly worked in small groups of seven with a facilitator to ensure that all had an opportunity to express their opinions and hear the opinions of others, including visiting experts. By Day Two more proposals were developed and the original eleven proposals were expanded until nearly 50 proposals were created (see Appendix 2). Prior to prioritizing this lengthy list, participants considered the criteria they would employ, i.e. the essential characteristics of a healthy democracy. Their chosen criteria follow. The above list was further reduced to determine the top five characteristics that would lead to the sort of democracy they would wish to leave for future generations. In order to apply the characteristics to the list of proposals, the lengthy list of 51 ideas was reduced to 13 through a prioritization process. Interestingly, and perhaps unsurprisingly, the 13 proposed ideas are closely aligned to the original 11 proposals that were developed online prior to the Citizens’ Parliament. 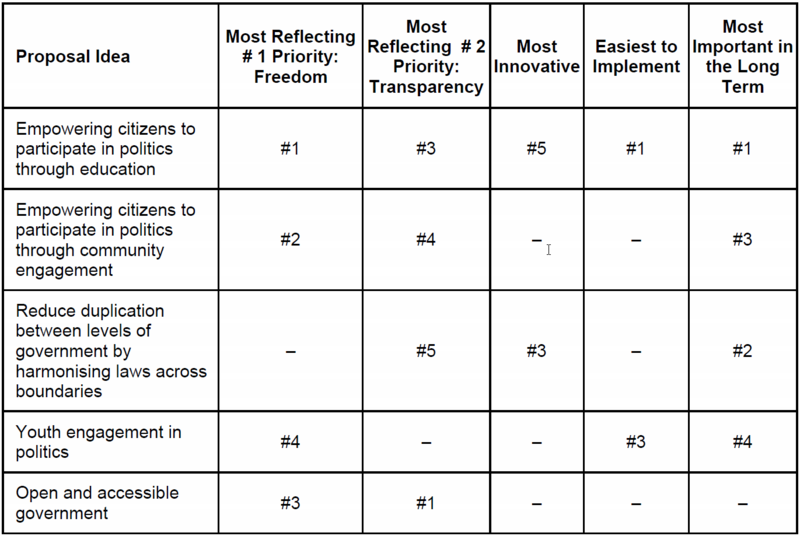 Using the top five characteristics the list of 13 prioritized proposals was considered in order to determine which of those best met the characteristic of freedom. The first priority proposal goes beyond traditional education. Citizen parliamentarians delivered a strong message that education needed to be done differently, that experiential education which practiced the sort of democratic methods used in the Citizens’ Parliament should be used early in the lives of citizens. The second priority, similarly, was focused on innovative methods for community engagement: for example, deliberative forums and online environments—again, mirroring the positive experience of the Citizens’ Parliament. The third priority was hotly debated and attention was paid in particular to unifying laws across state borders. Senator John Faulkner: “The Citizens’ Parliament provides the opportunity for Australians to gather and look towards our future… The ideas that come from the Citizens’ Parliament I can assure you will receive serious consideration from government”. “Your voices need to be heard… and we need to listen”. Lowitja O’Donoghue. “I see why politics and this process should be taught in school”. Politicians should be made to deliver on their promises. An independent auditor could report on progress of implementing promised programs or policies. At the end of the term, the political party could report on implementation of promises and why promises which weren’t kept were not implemented. A Bill of Rights entrenches in law basic rights that citizens have in the society. It could include freedom of speech and assembly, separation of judiciary, religious institutions and government, presumption of innocence, freedom from unwarranted search, seizure and arrest. Some suggested rights may be contentious, e.g., right to life and freedom from unjust taxation, depending on interpretations. Proposed responsibilities include to avoid force or fraud in relations with others, take responsibility for one’s own behaviour, raise children in a safe, happy, healthy home and care for the environment. A Citizen Initiated Referendum is a legislated provision to enable citizens to request a referendum (e.g. as in Switzerland which has regular CIRs and some States in the USA). To be put before the people, the proposal requires the signatures of a certain number of petitioners (e.g. 50,000 in Switzerland where if the vote achieves over 50% it is successful). This proposes making it easier for people to participate in politics, by providing more innovative and earlier education, such as using websites and public television and by providing forums, such as the Citizens’ Parliament, to enable this participation to happen. This proposes having a fixed term of government so the government is required to go to an election at regular intervals at a certain date. It also proposes longer terms of government to allow for long term planning, with elections being held every five years, with associated senate terms of ten years. The proposal suggests removing preferential voting which is seen as unfair. (Preferential voting is where a person lists their preferences in votes for the election. Those with the least number of votes are eliminated and the votes they had are distributed according to their second preferences. This continues until a clear winner arises) Instead, a system of ‘First past the post’ is proposed where the person with the largest number of votes wins the election. In this system a person with less than 50% of the votes may win the election. This is a system where people are elected according to the percentage of the vote they receive. This makes it more likely independents and smaller parties may be elected. A quota system refers to a system where certain seats are allocated to particular groups, for example, in New Zealand there are specified seats for Maori and in the Labor Party, a certain number (quota) of seats must be contested by female candidates. The proposal is to have only federal and regional governments, with local government to be replaced with larger regional councils. Major laws and policies would be decided at the federal level. A full senate election would be held at each general election. Many laws which differ in the different states should be made consistent to avoid duplication or differing requirements. A task force could examine possibilities for unification of legislation across the states and territories. Suggested solutions also include rationalising local councils, federal control of issues and a legislated Bill of Rights. • Leadership programs which align with the electoral process and electing school leaders, with involvement of political leaders. 1. Accountability regarding political promises and a procedure for redress. Politicians should be made to deliver on their promises. An independent auditor could report on progress of implementing promised programs or policies. At the end of the term, the political party could report on implementation of promises and why promises which were not kept weren’t implemented. 2. Bill of Rights and Responsibilities. A Bill of Rights entrenches in law basic rights that citizens have in the society. It could include freedom of speech and assembly, separation of judiciary, religious institutions and government, presumption of innocence, freedom from unwarranted search, seizure and arrest. Proposed responsibilities include to avoid force or fraud in relations with others, take responsibility for one’s own behavior, raise children in a safe, happy healthy home and care for the environment. 3. Citizen Initiated Referendum. Another possibility is to combine a public deliberative forum with CIR. A Citizen Initiated Referendum is a legislated provision to enable citizens to request a referendum (e.g. as in Switzerland which has regular CIRs and some states in the US). To be put before the people, the proposal requires the signatures of a certain number of petitioners (e.g. 50,000 in Switzerland where if the vote achieves over 50% it is successful). 4. Empowering citizens to participate in politics through education. Provide more innovative and earlier education (also for new migrants), also using web sites and public television. 5. Extend and fix the term of government. This proposes having a fixed term of government so the government is required to go to an election at regular intervals at a certain date. It also proposes longer terms of government to allow for long term planning, with elections being held every five years, with associated Senate terms of ten years. 6. Change the electoral system – First Past the Post. The proposal suggests removing preferential voting which is seen as unfair. Instead, a system of ‘First past the post’ is proposed where the person with the largest number of votes wins the election. In this system a person with less than 50% of the votes may win the election. 7. Change the electoral system – Proportional Representation. This is a system where people are elected according to the percentage of the vote they receive. This makes it more likely independents and smaller parties may be elected. 8. Change the electoral system – Introduce a Quota system. A quota system refers to a system where certain seats are allocated to particular groups, for example, in New Zealand there are specified seats for Maori and in the Labor Party, a certain number (quota) of seats must be contested by female candidates. 9. Remove or Reduce State Level of Government. The proposal is to have only federal and regional governments, with local government to be replaced with larger regional councils. Major laws and policies would be decided at the federal level. A full senate election would be held at each general election. 10. Reduce duplication between levels of Government by harmonising laws across state boundaries. Many laws which differ in the different states should be made consistent to avoid duplication or differing requirements. A task force could examine possibilities for unification of legislation across the states and territories. Suggested solutions also include rationalising local councils and federal control of issues. 11. Youth engagement in politics. A grassroots education program beginning early. Education regarding listening to others’ views, how to make your own decisions and learning to go with decisions arrived at through voting. Education focussing on all aspects of government, the setup, the history, the good and the bad. Leadership programs which align with the electoral process and electing school leaders, with involvement of political leaders. 12. Attending to over-government. We need an overarching strategy to reduce over-government. For example, a standing committee to look at opportunities to correct glaring inefficiencies and attend to human rights breaches. 13. Empowering citizens to participate in politics through community engagement. Making it easier for people to participate in politics by providing forums such as the Citizens’ Parliament. Draw on citizen participation in reviews prior to new regulation. Correct the disproportionately higher level of influence of business professional and other special interest groups. We need a formal body, for example an Ombudsman or Commission, with responsibility to improve the capacity of citizens to participate. 14. Reforming parliamentary procedure. MPs should not be able to hide behind parliamentary privilege. They should set an example and be open to prosecution like any other person. Independent speaker and President of each house and improved Parliamentary debate. Politicians should be setting a better example in their behaviour in parliament. 15. Ensuring the expertise of ministers. When given portfolios ministers should get a crash course in what the portfolio involves. Alternatively, ministers should be put in positions relative to their work and life making use of their existing expertise. Politicians should be paid more for leadership and management skills. 16. Exposing ministers to real world experiences. For example, mandatory two day experience of public hospital emergency ward would lead to better pay and conditions for nurses. 17. Independent evaluation of the effectiveness of government expenditure. Check on wisdom of expenditure, prevent waste, and achieve good value for money. 18. Multiple candidates within each party. Parties should nominate up to 3 candidates to reflect different views within the party. 19. Allowing conscience votes in Parliament as the normal way of doing things. Democracy works best when there is a bipartisan (or multi-party) approach. Members should be accountable to the electorate and not the party. 20. Instant feedback on proposed legislation. With modern communications technology put proposals to an advisory vote by the people. 21. Ban or cap political donations. All candidates funded by taxpayers’ money so can campaign on equal footing. Cap donations to equalise influence of lobby groups. 23. Open and accessible government. So anyone with a question can get an answer, user friendly and free from jargon, e.g. unified online resource – “allofgovernment.gov.au”. 24. Recall of underperforming or misbehaving politicians. Through voter-initiated referendum. 25. Curb superannuation and allowances for politicians. Bring into line with community expectations. Stop perks like limousines, VIP jets, first class air fares. 26. Abolish the Senate. They are not representative. Do the same with state upper houses. They are a waste of time and money. Queensland does not have an upper house and operates successfully. 27. Resurrect the Republic debate, and/or a Referendum. Start a national conversation as soon as possible. 28. Electronic voting for elections. 29. Abolish political parties. One idea for an alternative form of election would be a small Citizens’ Parliament i.e. 10-20 people (randomly selected) from each electorate from which one would be elected by all voters. 30. Legislate for an automatic review process for all new legislation. Review can be done by an ombudsman or independent body. Alternatively the body should be made up of a majority of citizens rather than academics and professionals. It should be controlled by the citizens and overseen by the professionals and academics. 31. Involving Registered Voters in Pre-selection. Adopt the American model of registered voters so that all registered voters are involved in the pre-selection of the member for that area and make them work harder. 32. Long-term planning and vision by government to overcome short-term thinking. 33. MPs with closer links to their electorates. They need to be more aware of the electorate’s needs for example through online access or regular newsletters. They should be less beholden to political parties. Party politics is anti-democratic. 34. Publicly funded media owned by the people. Programs with varied views. Dedicate time for progress reports on issues. 35. “Policy idol”. Possibly a reality TV show based on parliament. 36. Abolish name and ideal of an “opposition”. 37. Voting beyond own electorate. Change voting system so you can vote for a candidate outside your own electorate, in addition to or instead of your vote in your own electorate. 38. Optional preferential voting. You do not have to list preferences. 39. Minority group representation. Our “we” is all Australians. A system that gives more minority groups representation, particularly Indigenous people. 40. Change name of Australia. A change to the name of the country to possibly “A United Australia” similar to United States or United Kingdom. 41. Reconciliation Day. The possibility of an Aboriginal reconciliation day or 21st century treaty signed to recognise the past. This may lead to a national day. 42. Indigenous Citizens’ Parliament. Possibly a CP concerning Indigenous Australians, or a regional CP representative of all Indigenous peoples, if that would fit with Indigenous culture. 43. Recognise Aboriginal and Torres Strait Island peoples as the first people of Australia in the Constitution. 44. Cap on number of seats per party. To encourage multi party parliaments, place a cap on the number of seats a single party can hold in the parliament to (example) 2/5 of the total. This will encourage smaller parties, minorities and independents which will increase debate, maybe a bigger third party would emerge. 45. Citizens Question Time in Parliament. 46. Local CPs to discuss national issues. Every electorate or region to conduct a CP type forum in the first year of electoral cycle to discuss issues of National Importance – agenda not to be set by politicians. Recommendations to be presented in parliament. 49. Change the electoral system – Optional Preferential Voting. With the aid of some helpful debate, the team decided to withdraw the original proposal, ‘One Person One Vote’ and replace it with ‘Optional Preferential Voting’. This allows for an honest and accurate result via two options. Establish a Citizens’ Council. Independent non-political entity whose role it is to take submissions from individuals and community groups (non-commercial/political) to combine with similar proposals (e.g. 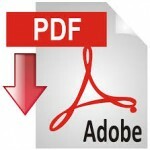 CP) and pass on to relevant ministers/departments – with guaranteed follow-up. Also to act as a general resource for queries re our system and processes from CP. Liaison between Federal, State and Local Government members. Federal and State Government representatives from the same area should meet formally and regularly with local council to facilitate understanding of local issues and ensure citizens’ needs are met. *These nine Citizen Parliamentarians were selected to present the Final Report to the Government.